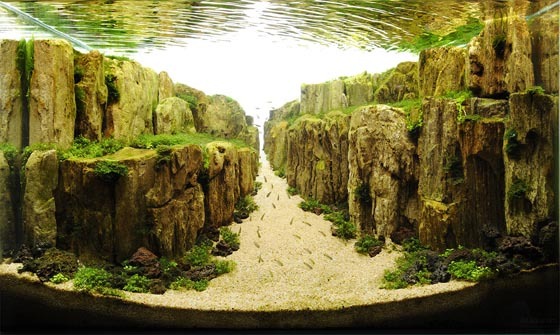 Aquascaping or aquarium design is the craft of arranging aquatic plants, as well as rocks, stones, cave-work, or driftwood, in an aesthetically pleasing manner within an aquarium. Just like gardening, but underwater gardening. Although the primary aim of aquascaping is to create an artful underwater landscape, the technical aspects of aquatic plant maintenance must also be taken into consideration. To ensure the success of an aquascape, aquarium designers need to possess large amounts of expertise in biology, design, photography, and excel in the art of patience since individual aquascapes can take months if not years to fully mature into a completed landscape. Collected here are an assortment of winners from the world’s largest nature aquarium and aquatic plants layout competition(IAPLC) which annually ranks hundreds of competitors from around the world. You can find more of those incredible underwater art here. Next story Unusual bathroom designs – from strange to stranger!